Animal tattoos are very popular designs. They are cute and are lovely to look at once they. They can be attention-grabbing too. Who wouldn’t adore seeing such lovely animals inked on the body? But just because these animal tattoos look adorable doesn’t mean they’re just as simple as that. Animal tattoos can have a good meaning and story to tell too. There’s no turning back once the tattooing process starts. While you can have it erased using modern laser tattoo removals, it can still cost you a lot. Tattoo removals will not just require you to spend hundreds of dollars on a single tattoo removal session but you also need to commit more of your time going through several sessions to fully get rid of your tattoo. To completely remove the ink on your body, it would take months or even years, depending on how the tattoo would react to the laser procedure. That being said, you always have to think first before you ink. One of the good tattoo ideas is animal tattoos. 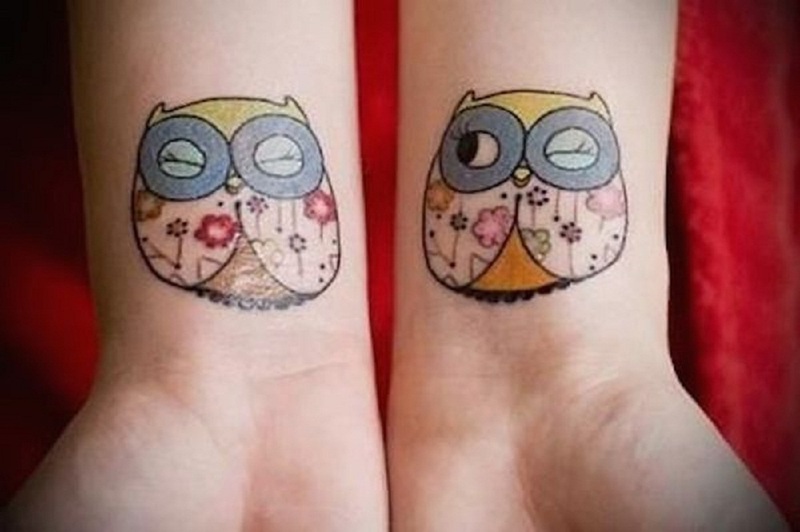 These designs are cute and timeless plus they can be meaning as well, particularly the owl tattoo design. Owls can symbolize many different things – from beliefs to even a person’s attitude. 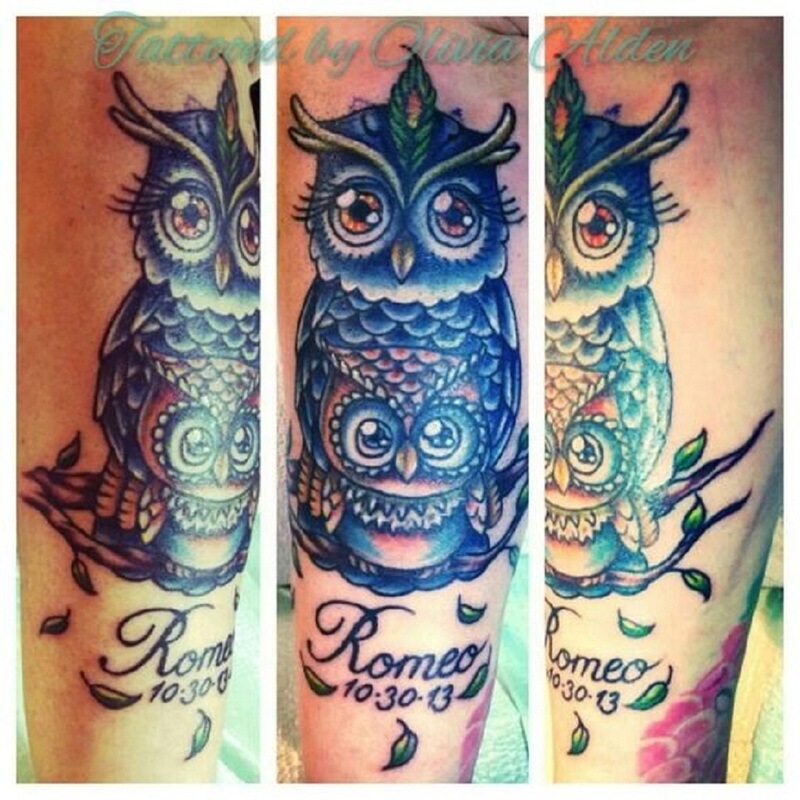 Additionally, the variation of owl tattoo designs has different meanings as well. The ancient Greek mythology says that Athena, the goddess of wisdom, is fond of the owl because of its fascinating eyes and solemn appearance. People also believe that owls are magical and that it has an “inner light” that’s responsible for the owl’s night vision. Moreover, the myth says that owls serve as protectors too. Greek armies believe that owls accompany and protect them during battles. It’s also a good omen for them if an owl flies over the Greek soldiers before a battle. Additionally, the myth says that owls provide inspirations for Greeks. While owls in ancient Greek is a positive sign, it seems as though Romans’ beliefs are the opposite. In Roman superstitions, they believe that owls bring bad omen, particularly death. They also suspect that owls have a connection to the deaths of Augustus, Julius Caesar, Agrippa, and Commodus Aurelius. Owls are often seen as a representation of wisdom and helpfulness during the early times. However, people started to fear and despise owls during the middle ages in Europe (between 500 and 1500 AD) because they believed that they are associated with witches. They also feared the sounds that owls make as they believed that it will bring negativities such as misfortunes and deaths. Other countries also associate owls with bad happenings. They especially pay attention to the cry of owls too. For them, owls’ hoot means grief, trouble, failure, death, or any difficult challenges in life. It was until during the 18th century that experts shed more light on owls by observing them closely. This reduced the mysteries and people’s negative beliefs about owls a lot. Since then, owls gained their position back. Today, most of us see owls as a representation of wisdom and attribute more positive things to them more. While there might still be people who think of owls negatively, they are still loveable animals. In fact, these nocturnal birds are very devoted, especially when humans raise them. They can get too attached to their handlers and eventually consider them as a family. Additionally, they establish long-lasting bonds with their family and their mate. Owls can indeed symbolize many things. As tattoo designs, owls can help you send a very meaningful message or could even help you show a bit of your personality. 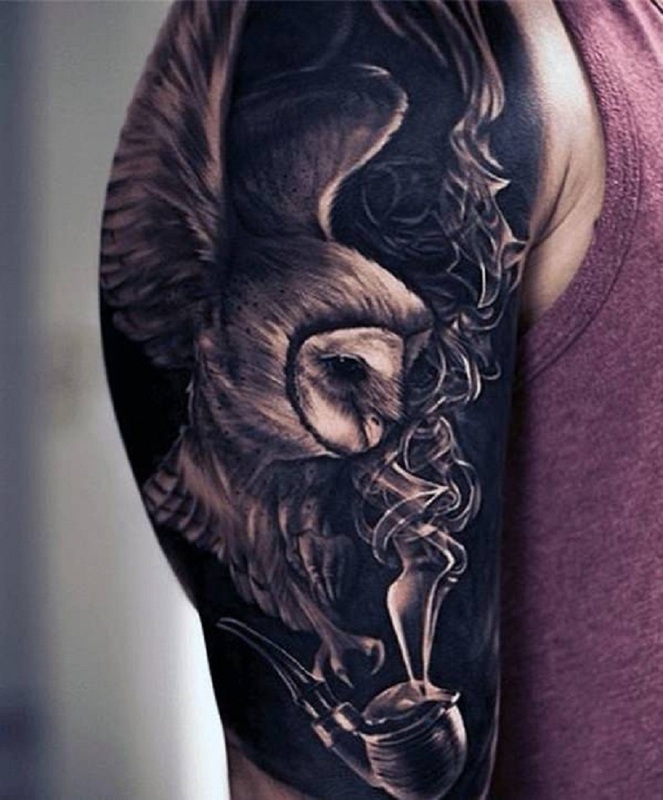 If you are still unconvinced enough to use owls as your tattoo design, we listed some over-the-top tattoo ideas for you based on your personality. You’ll not only get adorable body art with these but you’ll surely be able to reveal a part of yourself as well. 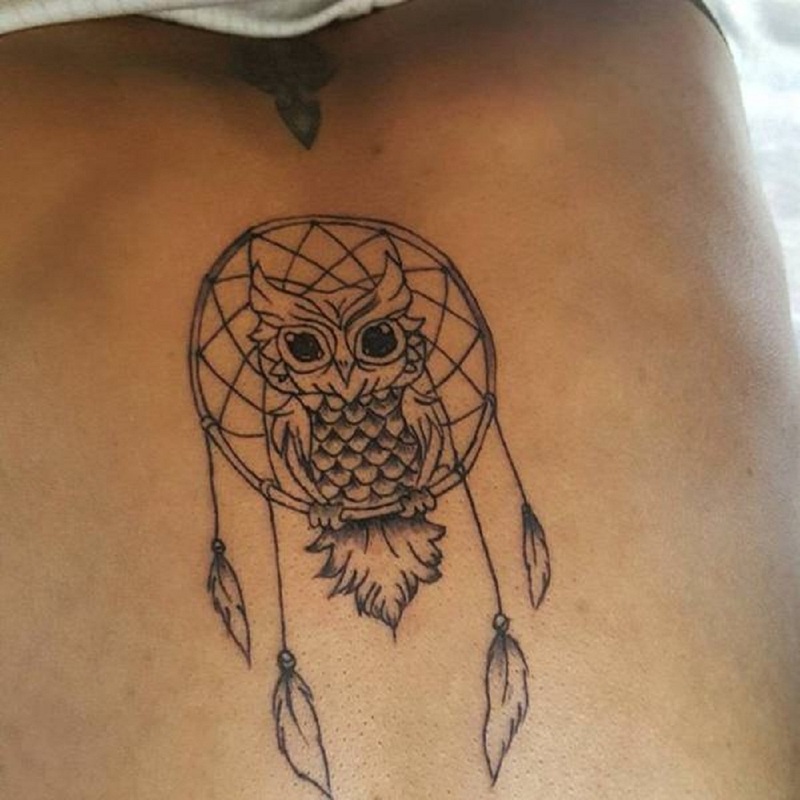 For those who dream of having good days ahead, an owl tattoo with a dreamcatcher will suit you. Owls and dreamcatchers are known as lucky charms. Having these designs will definitely help you achieve your goals while blocking bad luck away. 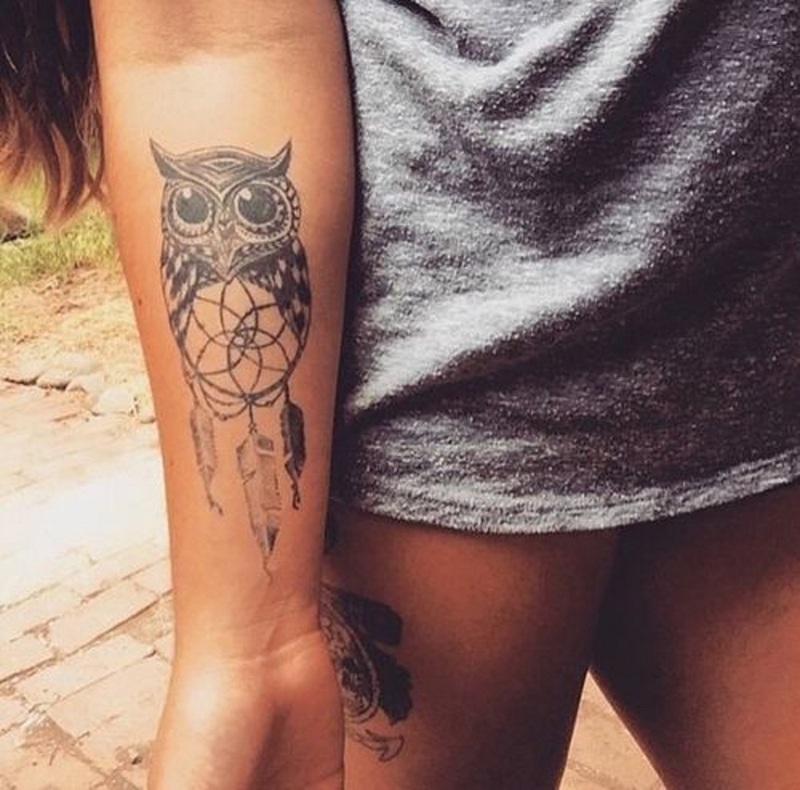 An owl tattoo with a dream catcher on the lower arm. Another dreamcatcher and owl tattoo on the lower arm but inspired by the russian doll design. 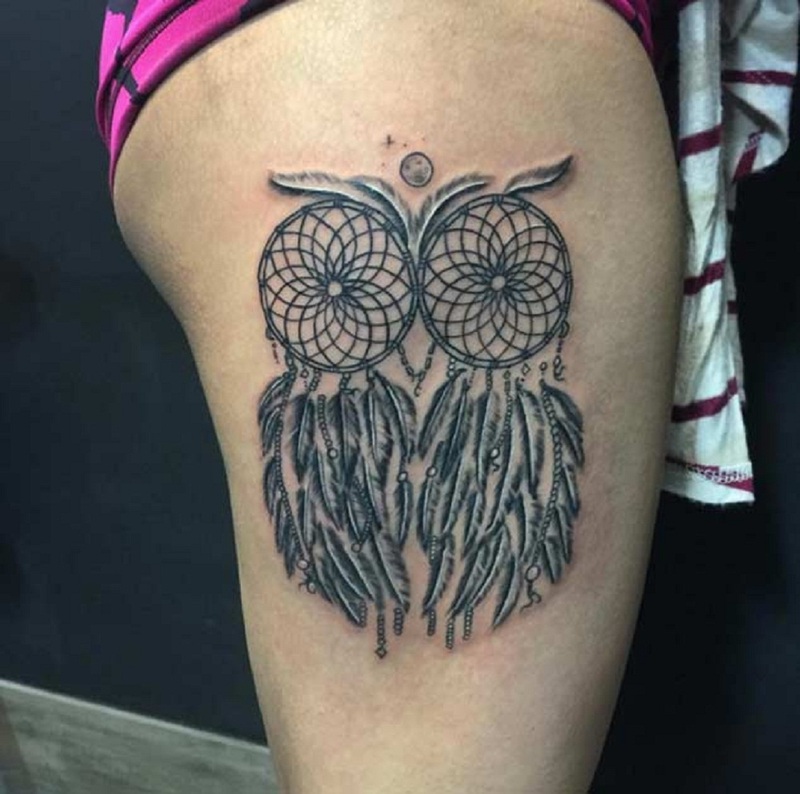 A simple dreamcatcher and owl tattoo where the owl sits atop the dreamcatcher. 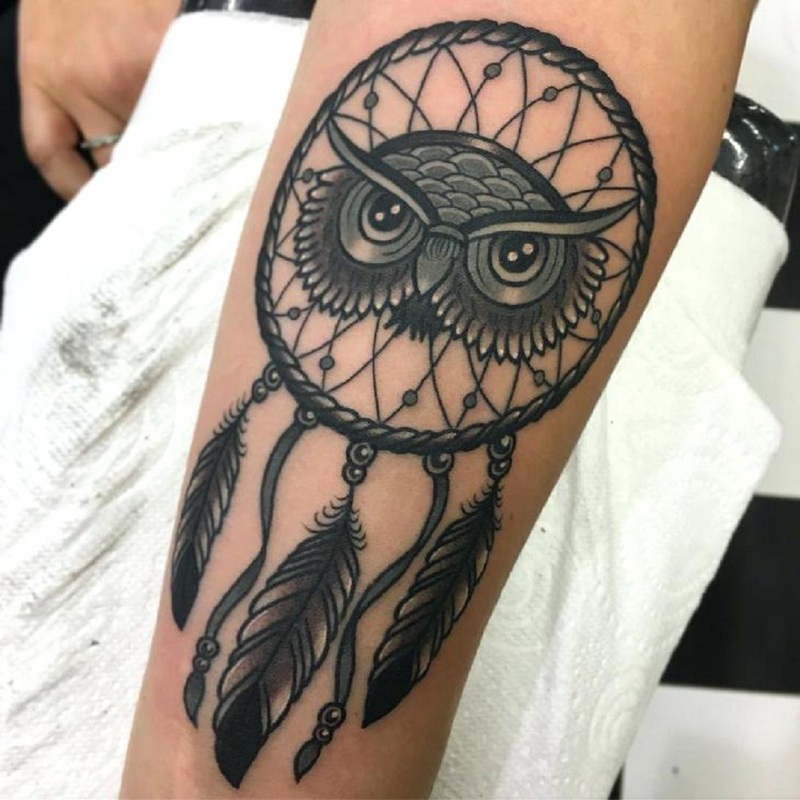 An owl’s face over a dream catcher tattoo on the lower arm. 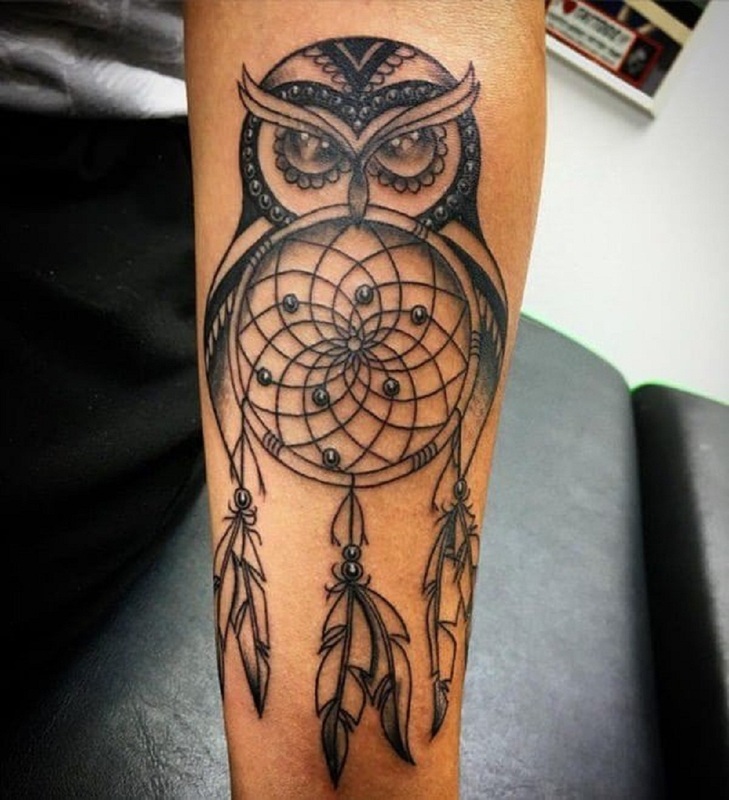 A cool dreamcatcher and owl tattoo morphed into one that will confuse everyone. Another morphed dream catcher and owl tattoo but this time, it’s colored using the watercolor technique. 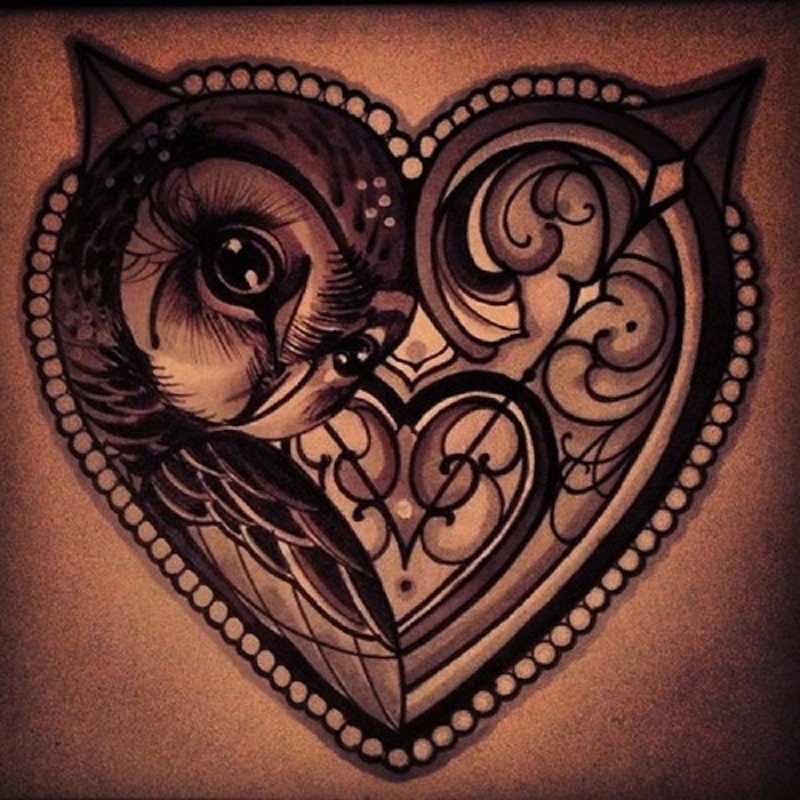 Mysterious type of people will be able to relate to purple owl tattoo designs. People often describe both the color purple and owl as mysterious yet imaginative. 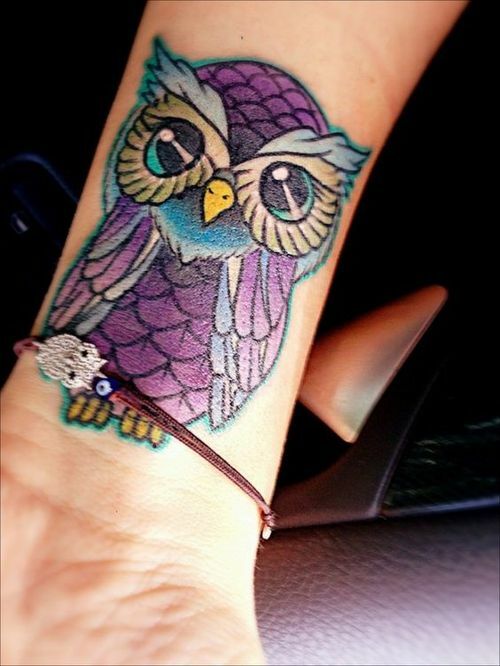 Hence, having a purple ink owl tattoo will show off your mysterious personality. 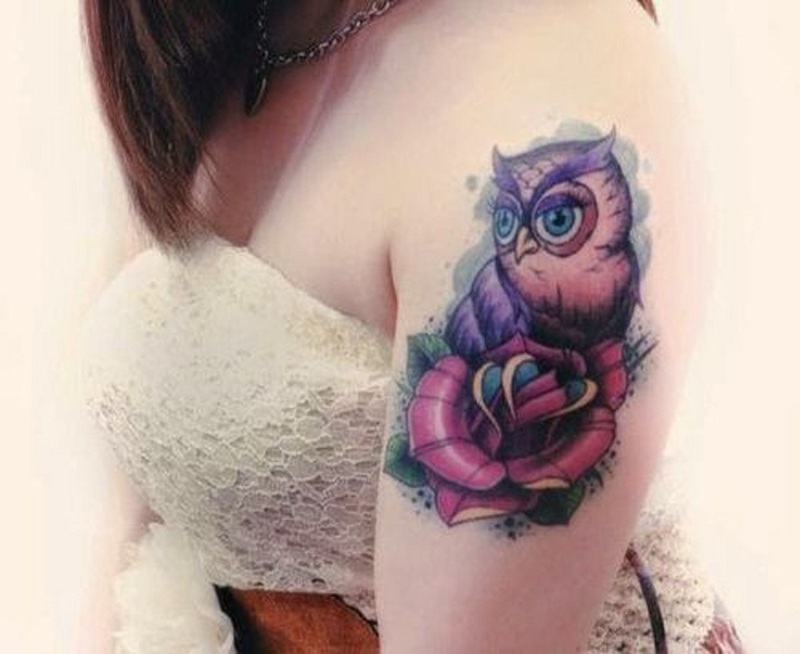 A cute purple owl tattoo on the lower part of the arm. 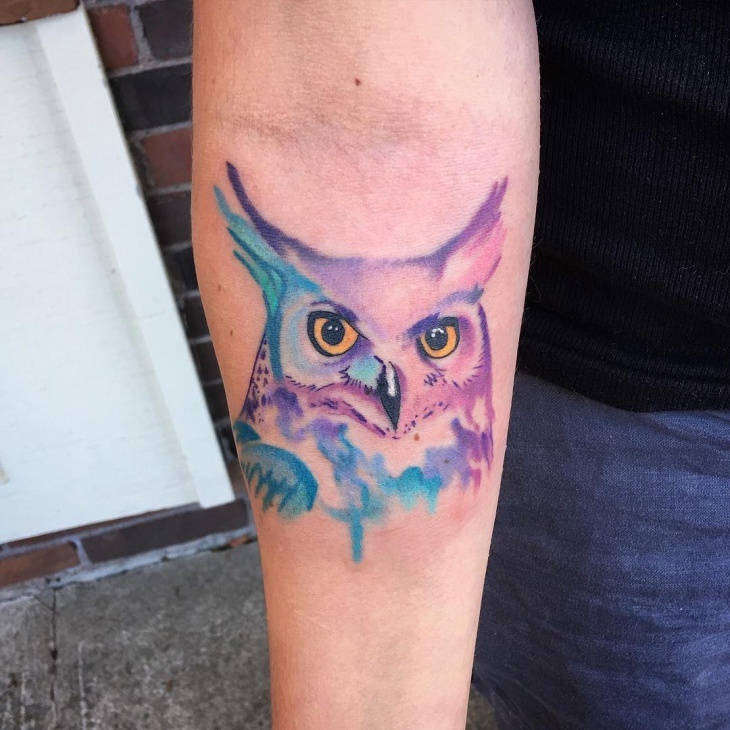 An eagle owl tattoo in purple and blue drawn using a watercolor technique. 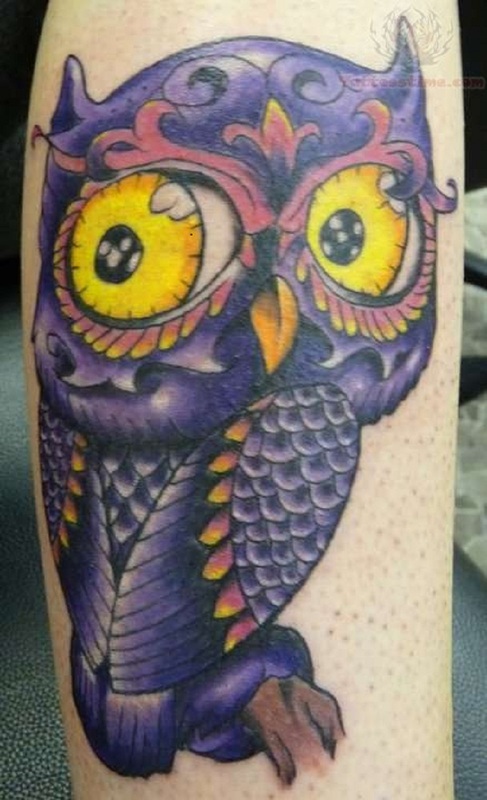 An elaborately detailed purple owl tattoo with bright yellow eyes. 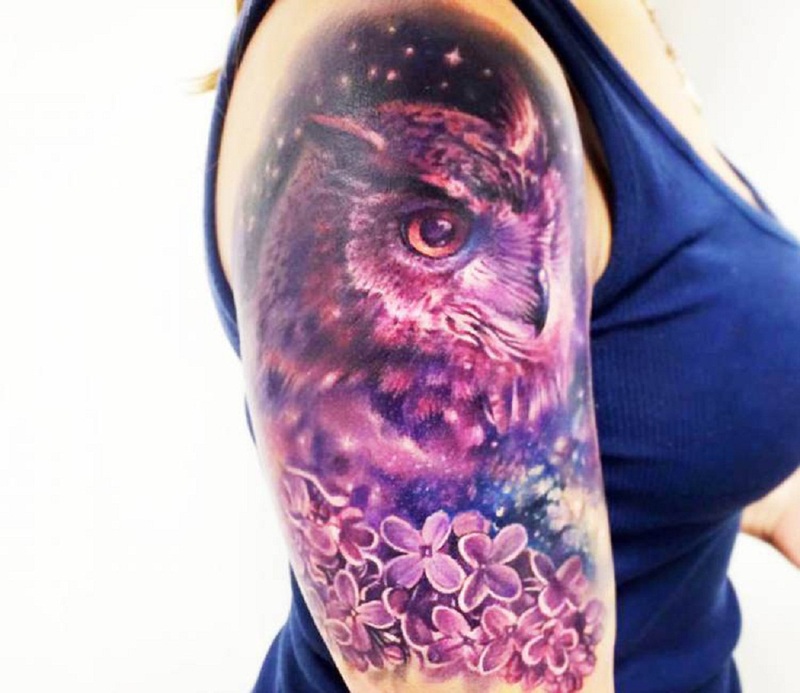 A galaxy inspired realistic owl tattoo with adorned with flowers. 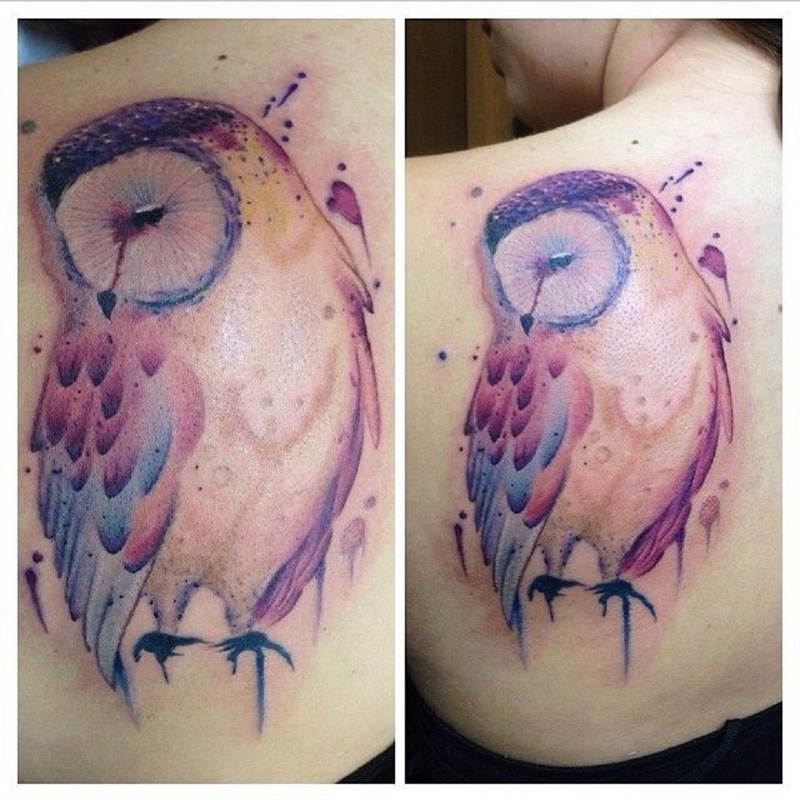 A purple barn owl tattoo with hints of multiple colors. 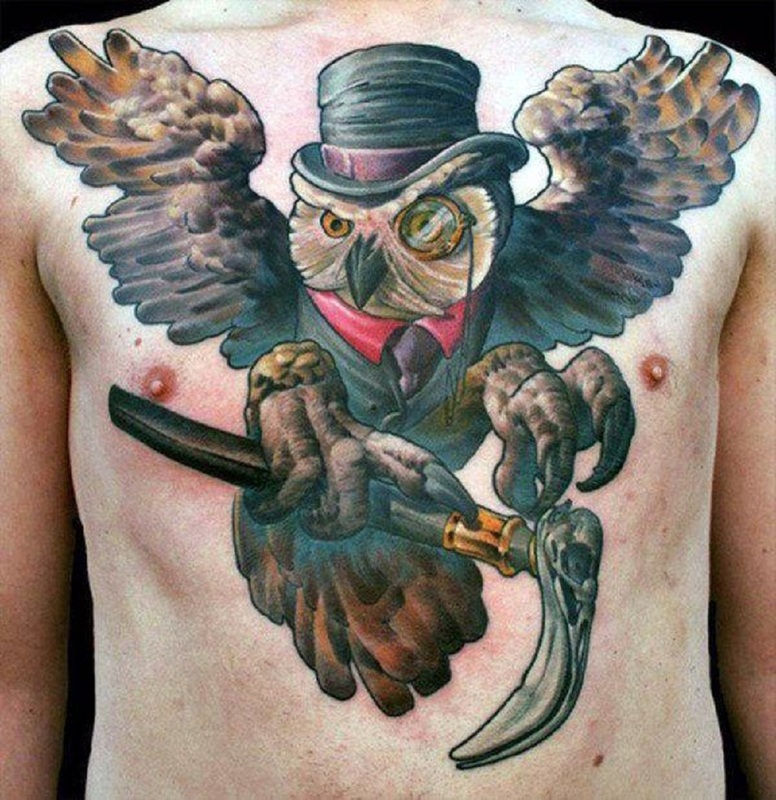 A big magical and enigmatic owl tattoo on the chest. Owls are one of the animals who is known for their devotion to their mates as well as their handlers or family. If their personality matches yours being loyal, these tattoo designs will suit you. 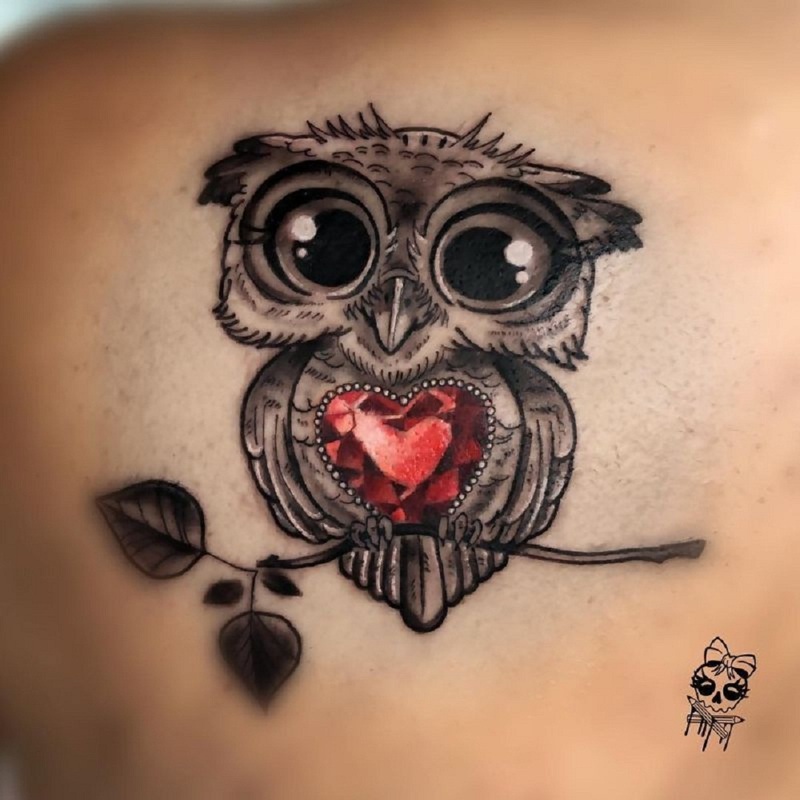 A black and grey owl tattoo inside a richly-detailed heart. A cute owl with a gem-shaped heart sitting on a branch. 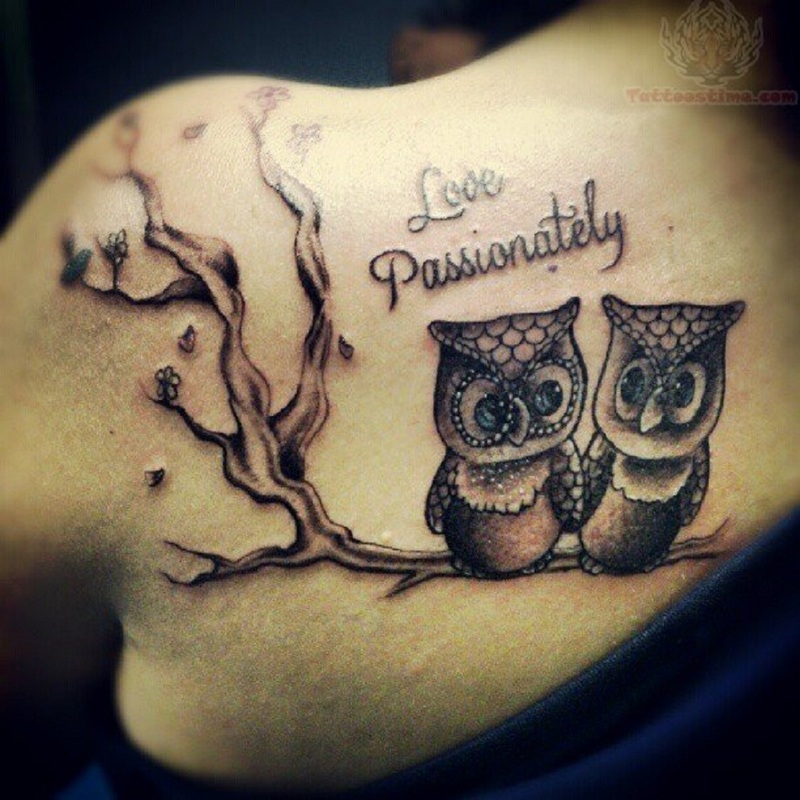 An intricately detailed abstract owl tattoo with a heart in the middle. 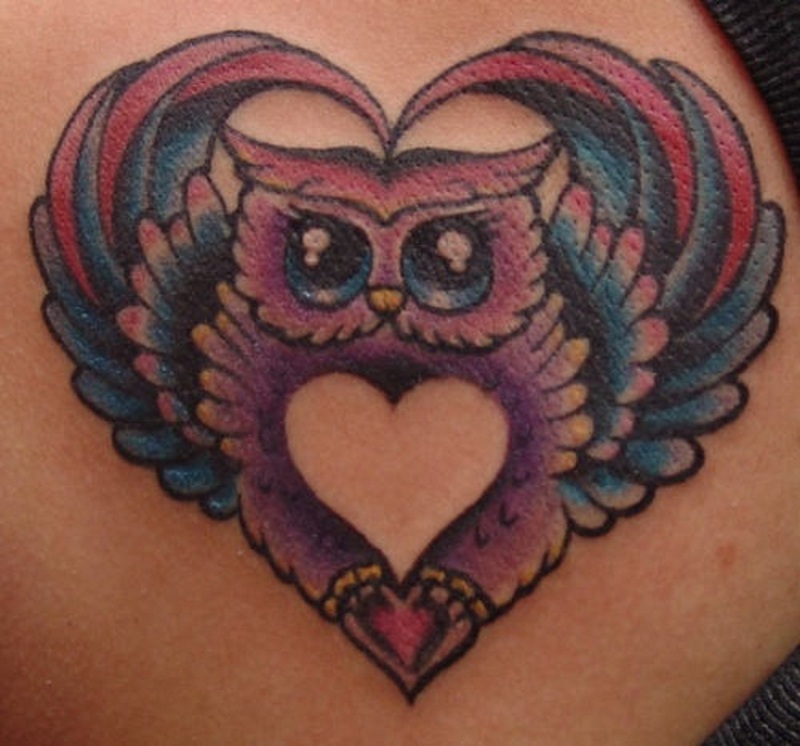 A colorful owl tattoo with heart-shaped wings, feet, and body. Some people believe that owls can predict the future and can look into the soul of a person because of their big eyes. 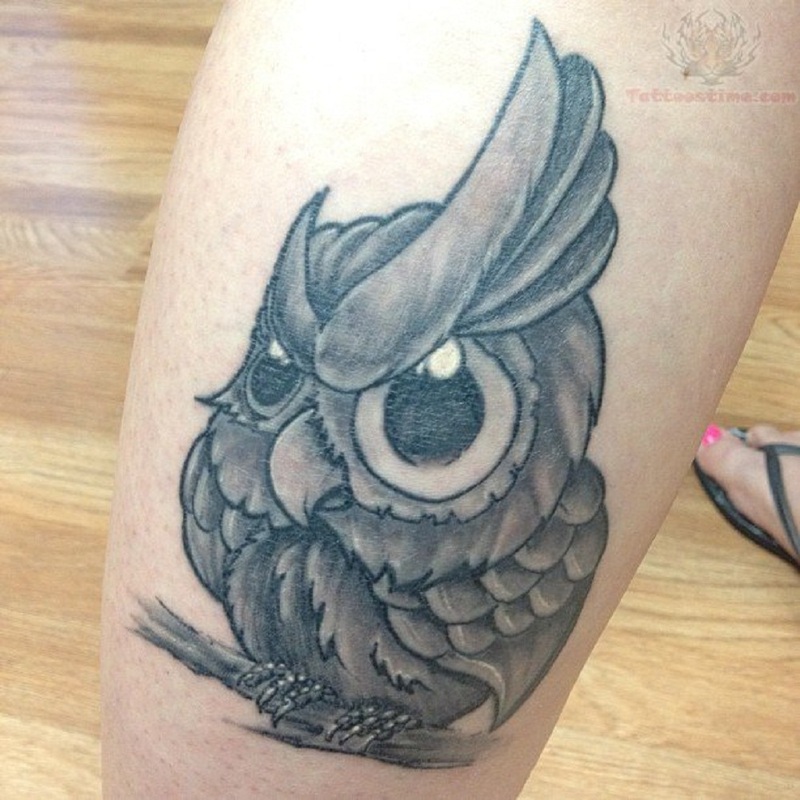 If you are like them who also have a good intuition, owl tattoos with big eyes (or great horned owls) will suit you. A black and grey ink small owl but with big eyes. Another black and grey owl tattoo with big eyes and intricate detail. 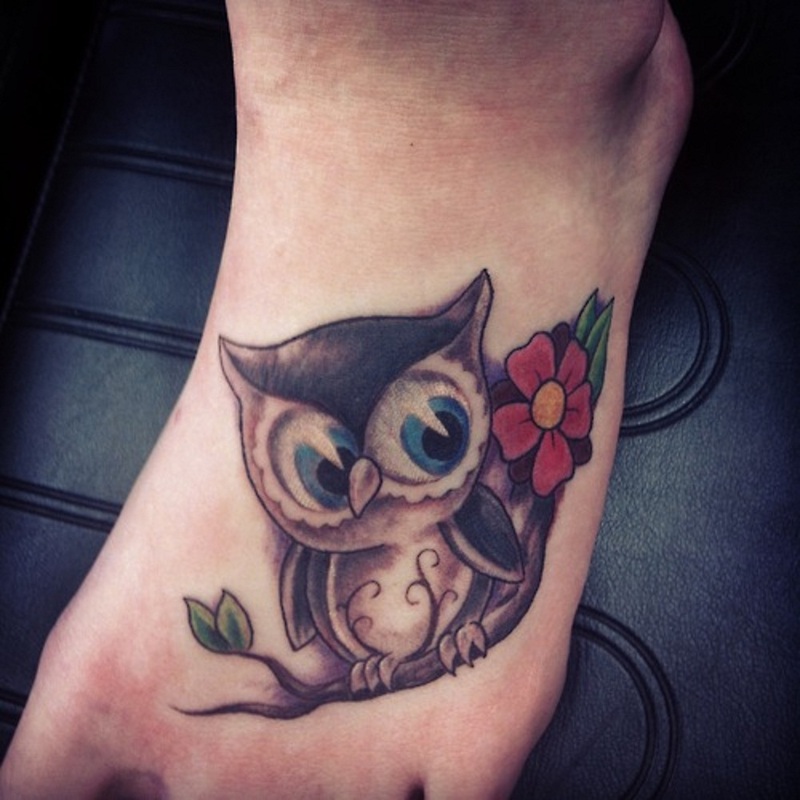 An owl tattoo with big blue eyes on the foot. A multi-colored owl with big eyes sitting on a branch. 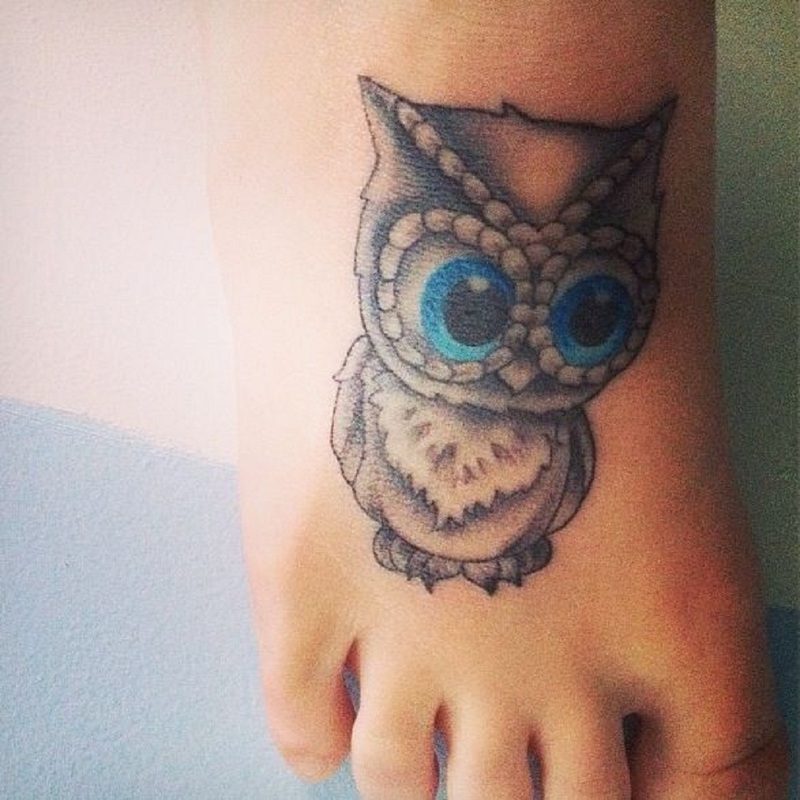 Another owl with big but blue eyes drawn on the foot. 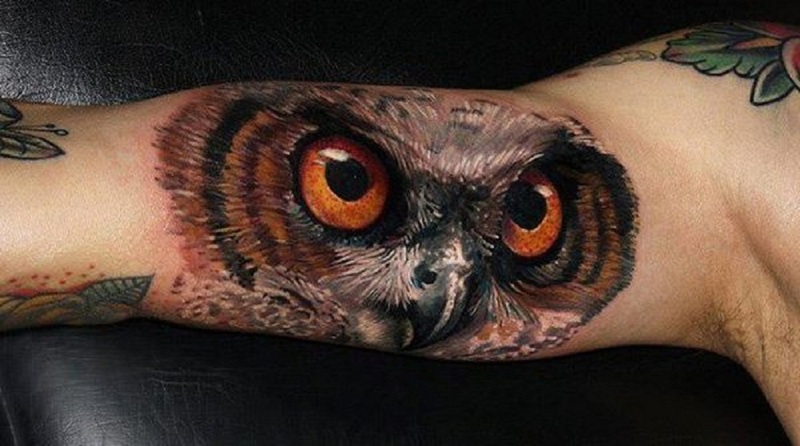 A 3D owl tattoo that have eyes that will stare into anyone’s soul. Birds, like owls, fly high in the sky. This nature of birds can symbolize a person’s love for freedom. 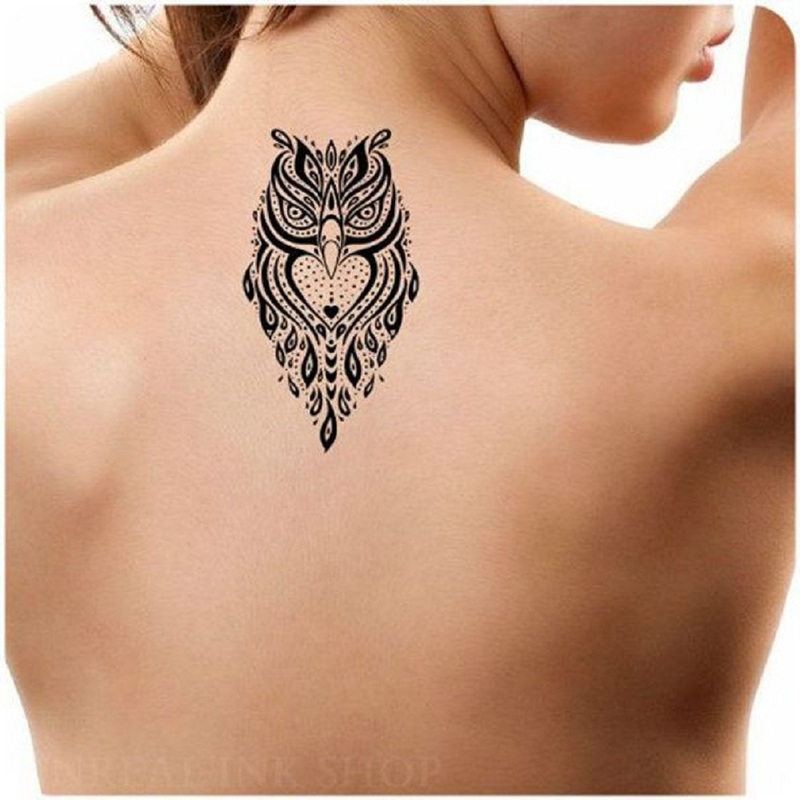 If you are a freedom-loving person, owl tattoos with open wings can show off your personality. 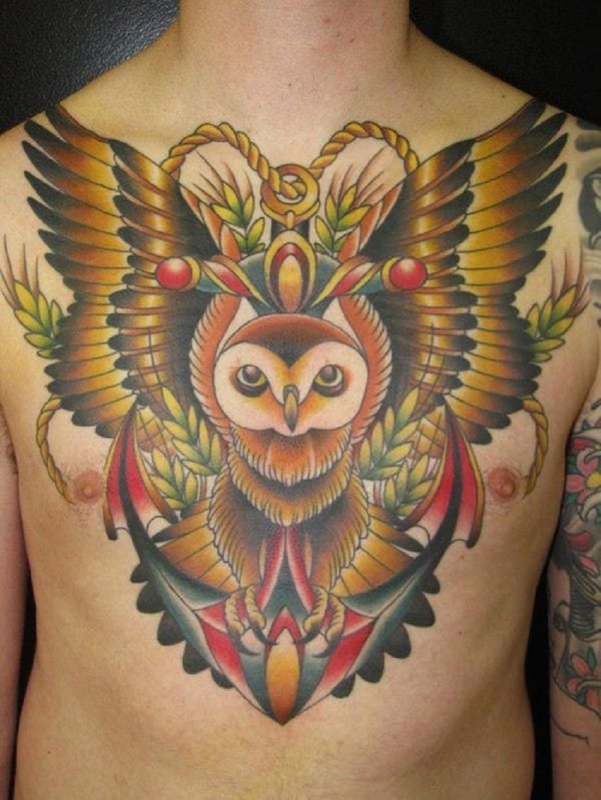 An intricate and multi-colored owl tattoo with spread wings on the chest. A colored owl sporting a dapper look with wings open. 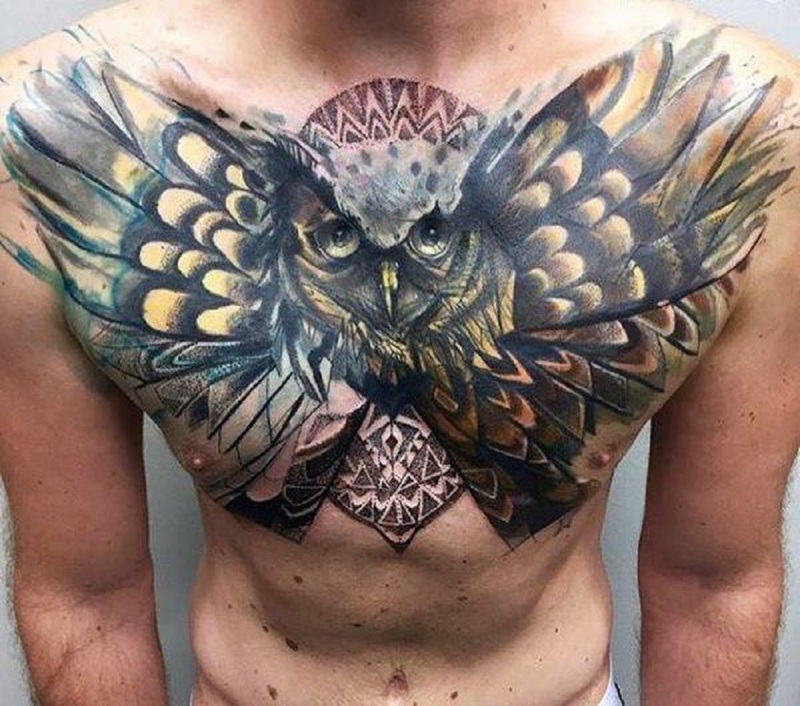 A 3D owl tattoo that appears as if it’s coming right out of the chest. 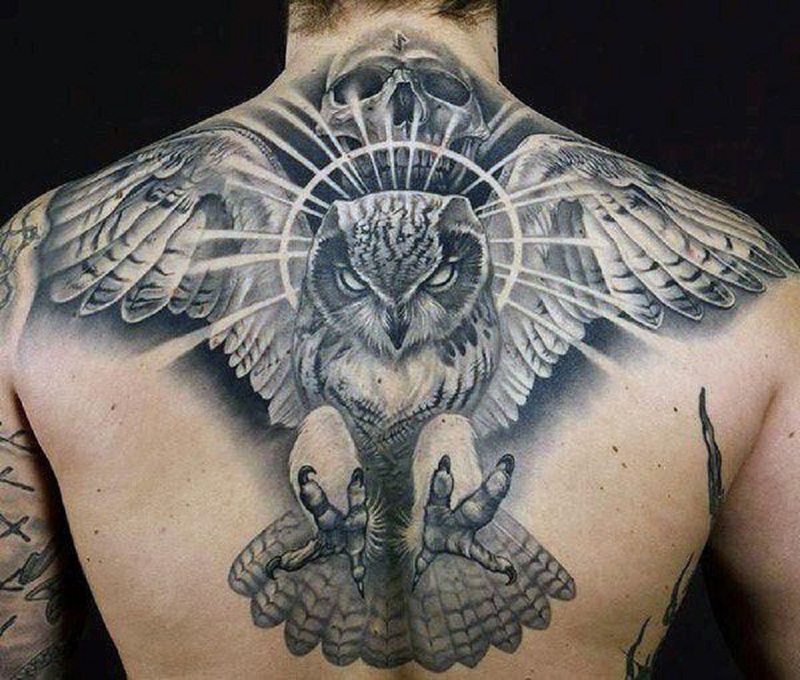 A big owl tattoo with a halo and wings outstretched. An snowy owl tattoo with a solid black background color. 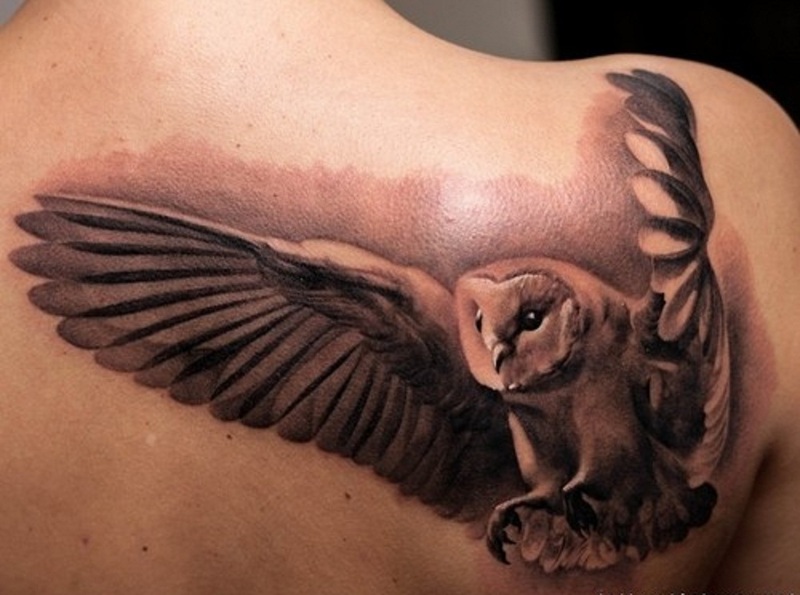 A very realistic owl tattoo with outstretched wings made using great shade work. Do you see a glass of water half full or half empty? If your answer’s the latter then you probably are not much of an optimist type of person. 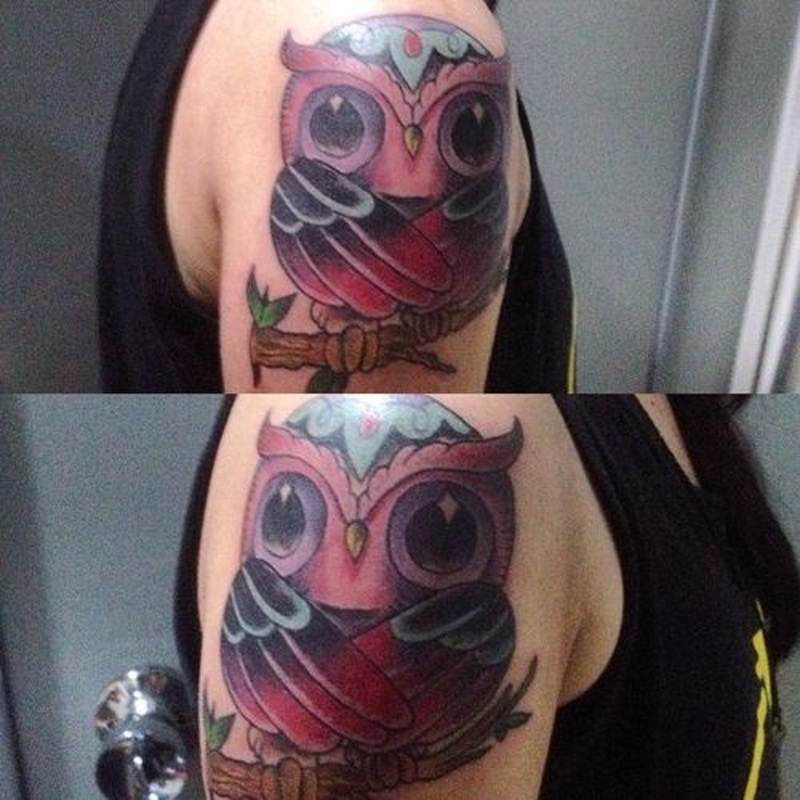 An inspiring owl tattoo is what you need. This tattoo design will always help you to think positive when the going gets tough. 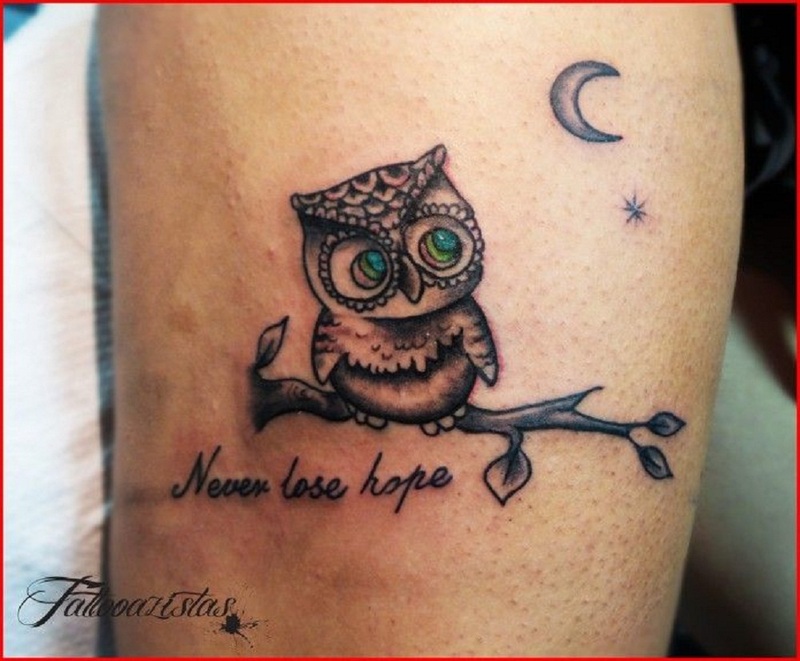 An owl tattoo that will remind you not to lose hope. 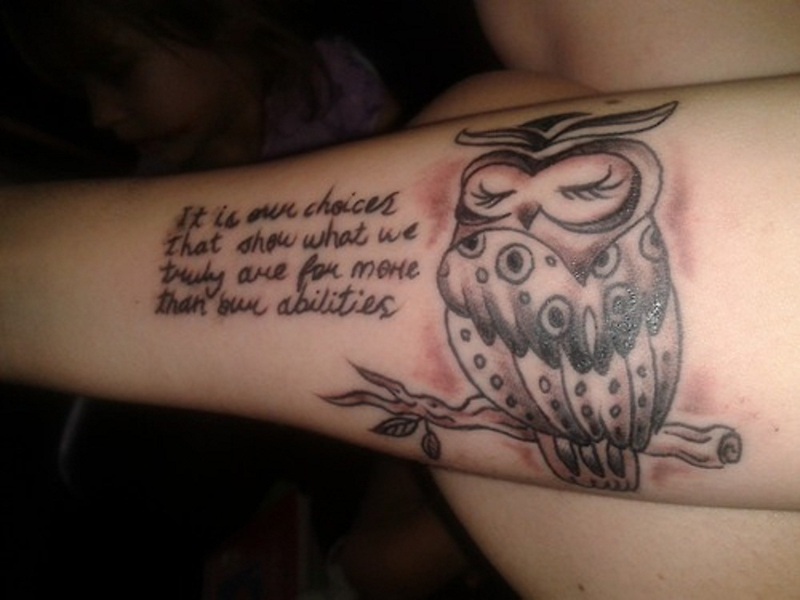 A philosophical owl tattoo inspired by the “Harry Potter” novel. 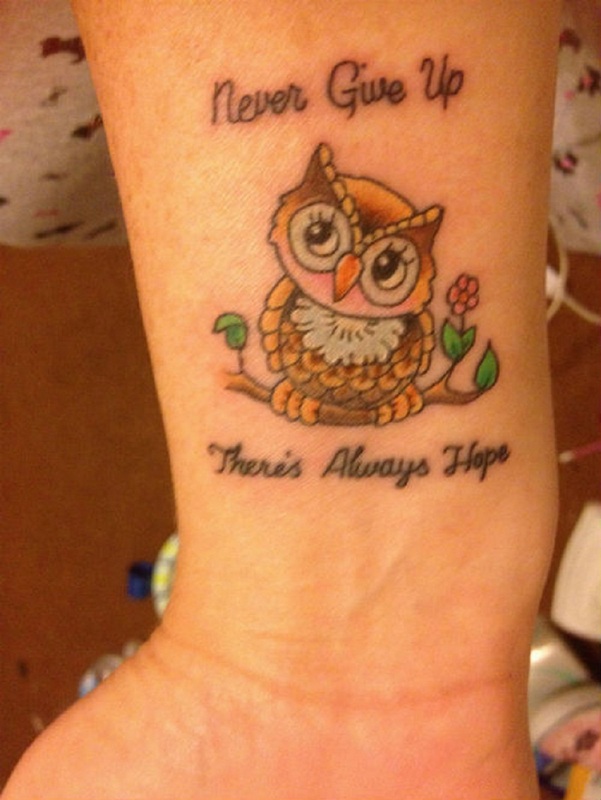 An owl tattoo that will remind you not to give up. 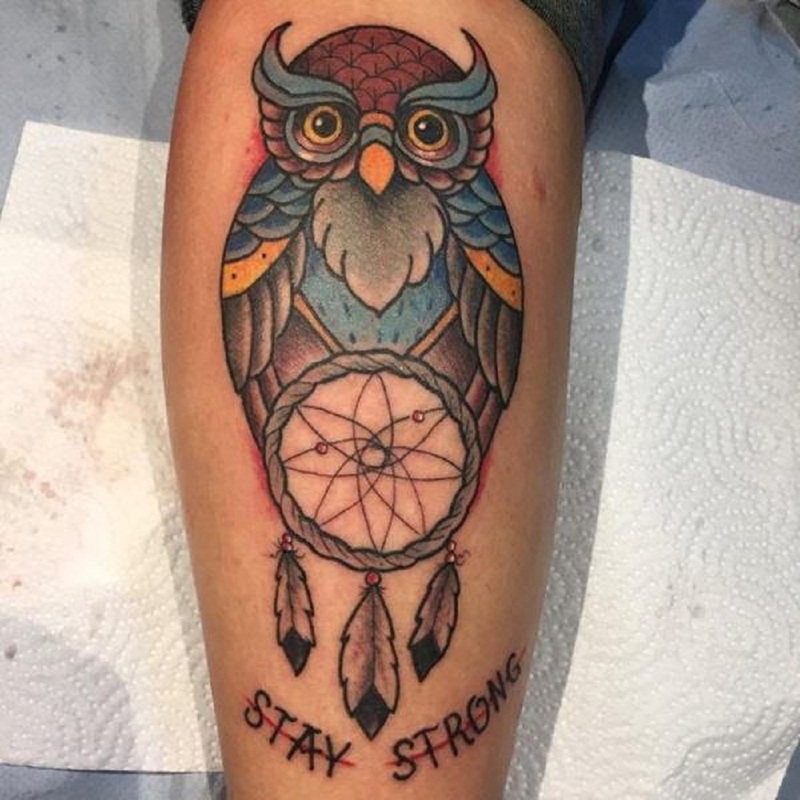 A colorful dreamcatcher and owl tattoo that will remind you to stay strong. Owls can represent many things but they popularly known as a symbol of wisdom. 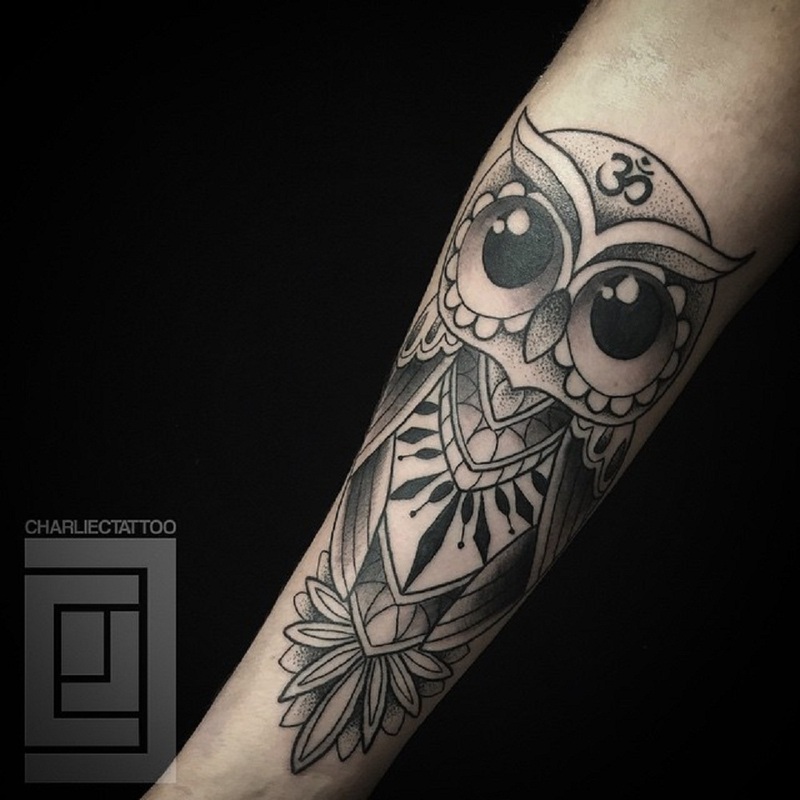 If you are a type of person who’s always willing to try and learn new things, owl tattoos with books or eyeglasses is definitely for you. This design will show your witty side. 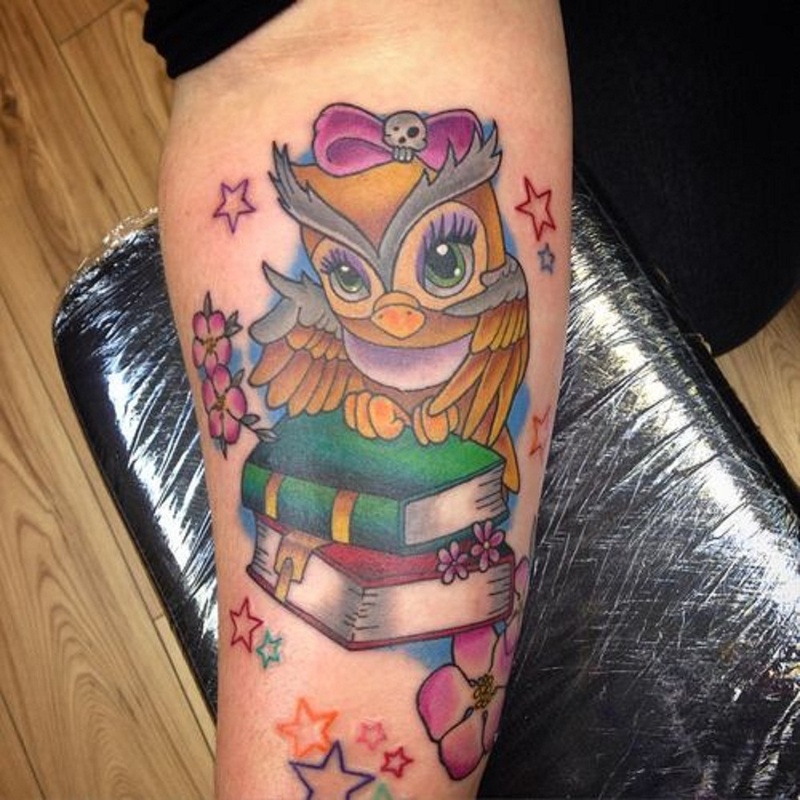 A girly owl tattoo adorned with books, flowers, and stars. 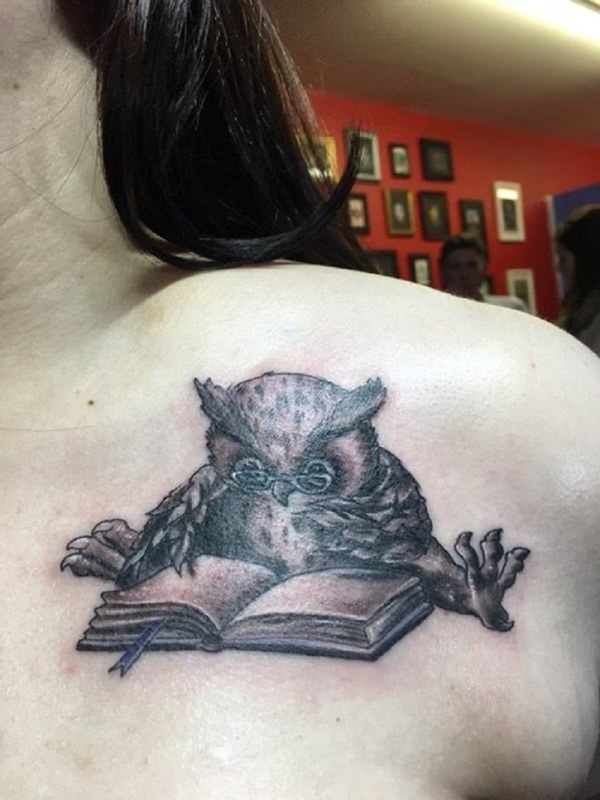 A soft owl tattoo where the owl seems as though it’s reading a book. An owl wearing a graduate cap, sitting on top of a book. 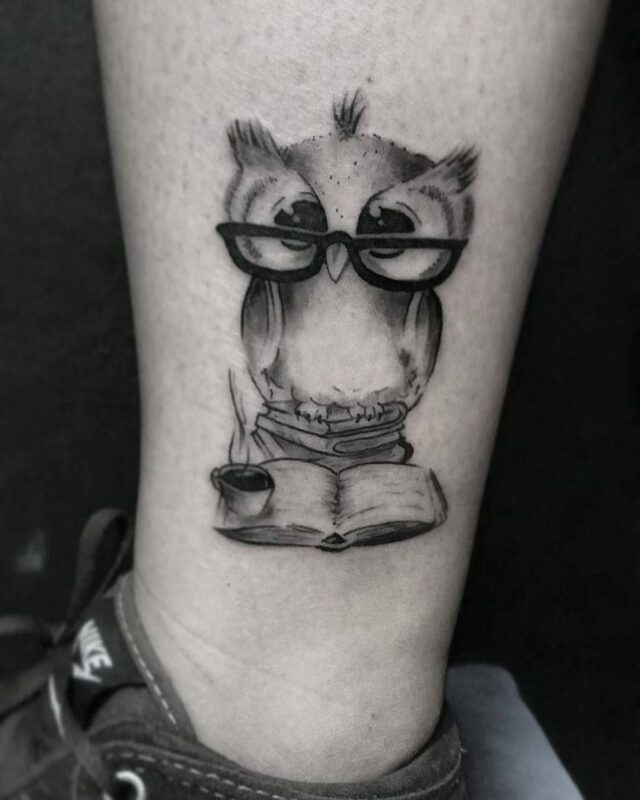 A very adorable black and grey ink reading owl tattoo. 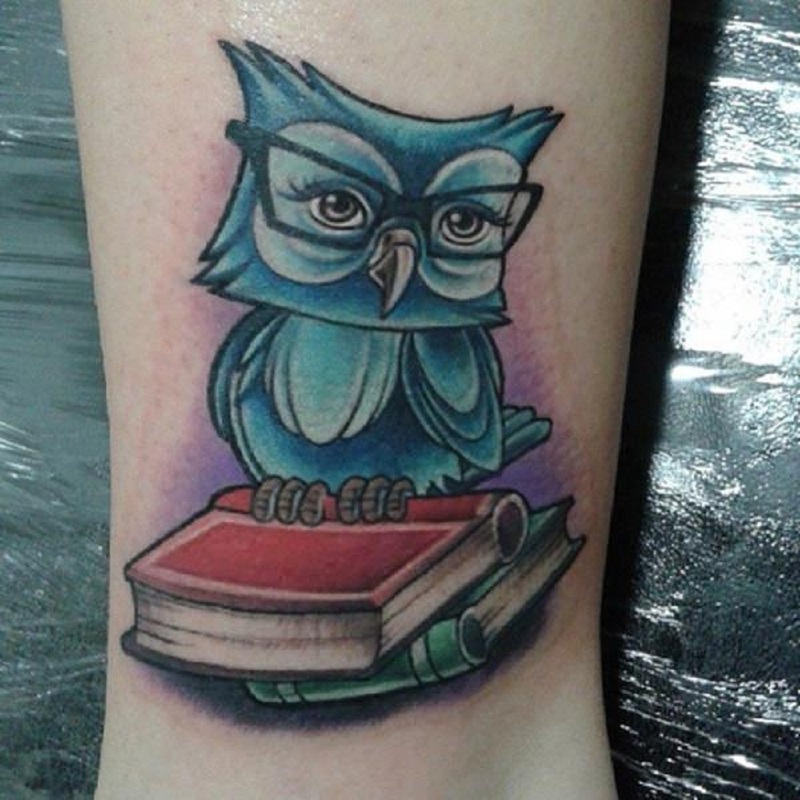 A sophisticated and smart-looking owl tattoo with books inked with various colors. If you are a person whom people always turn to for pieces of advice, chances are, they see you as someone who’s full of wisdom. 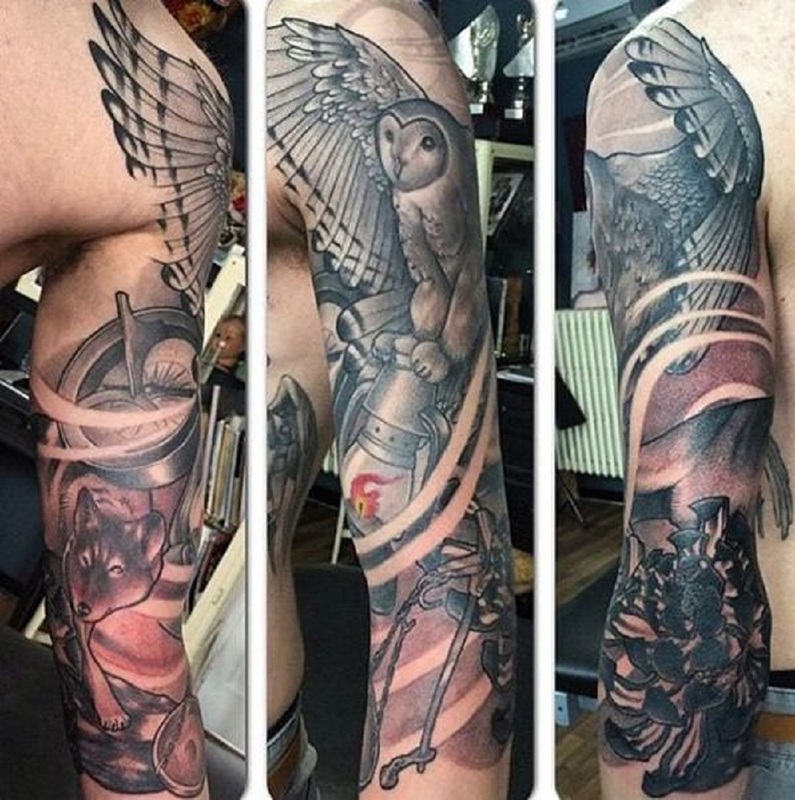 A tattoo designed with parliament or a group of owls that look like they’re discussing something or looking after one another can represent that. 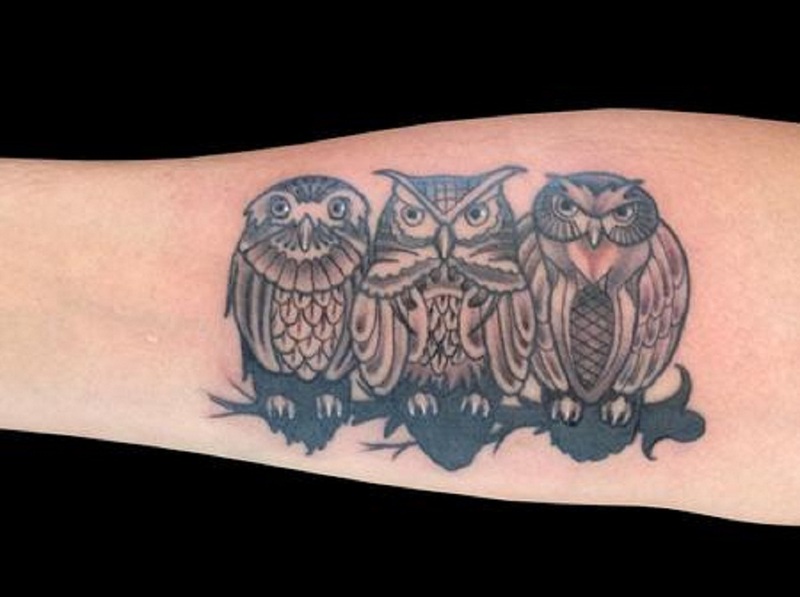 An owl tattoo that shows 4 owls that look like they’re exchanging ideas based on their expressions. 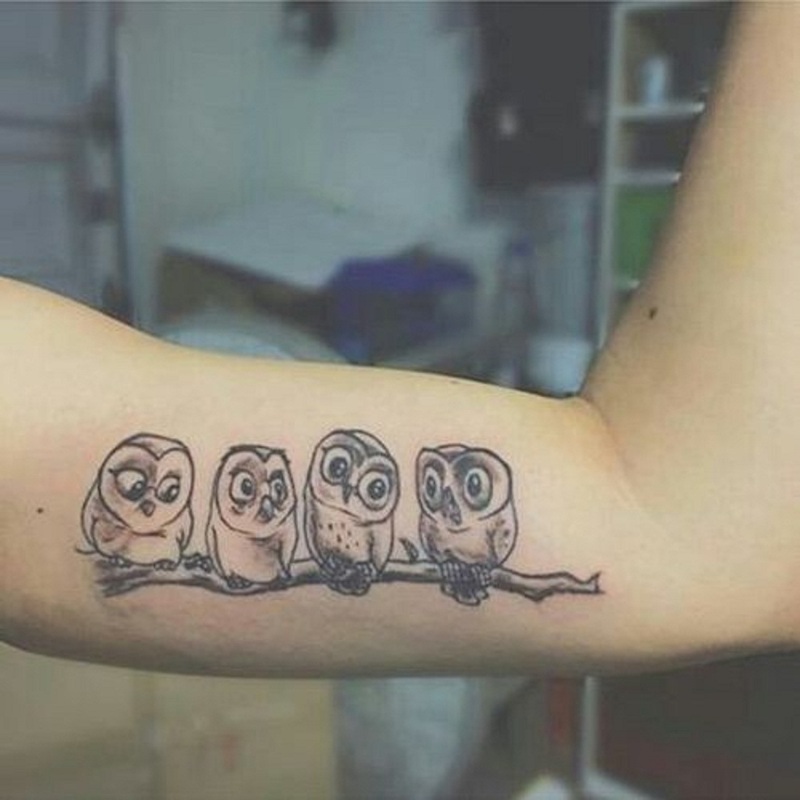 An owl tattoo showing 3 wise-looking owls looking like they’re about to give the best piece of life advice ever. 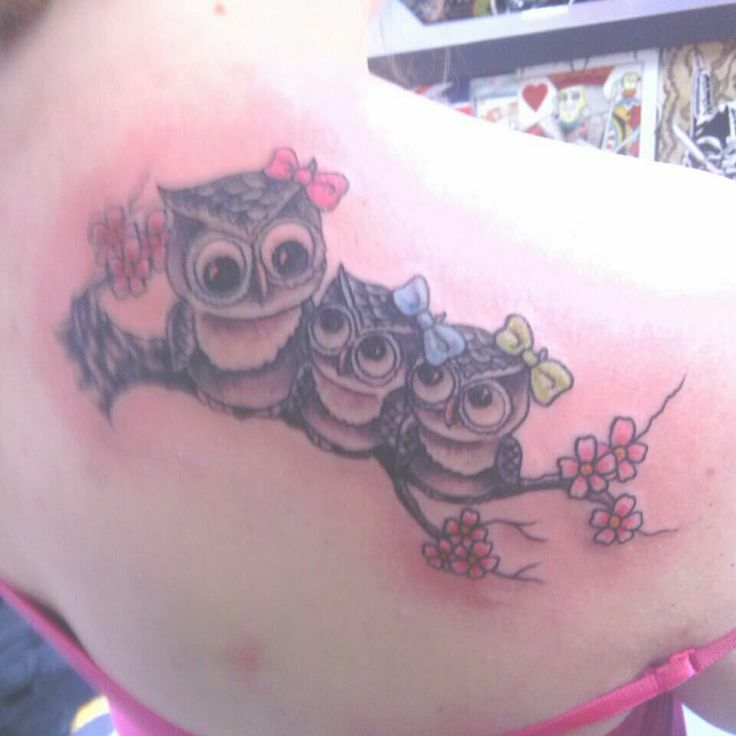 A family of owls tattoo where the mother seems like she’s teaching her children. 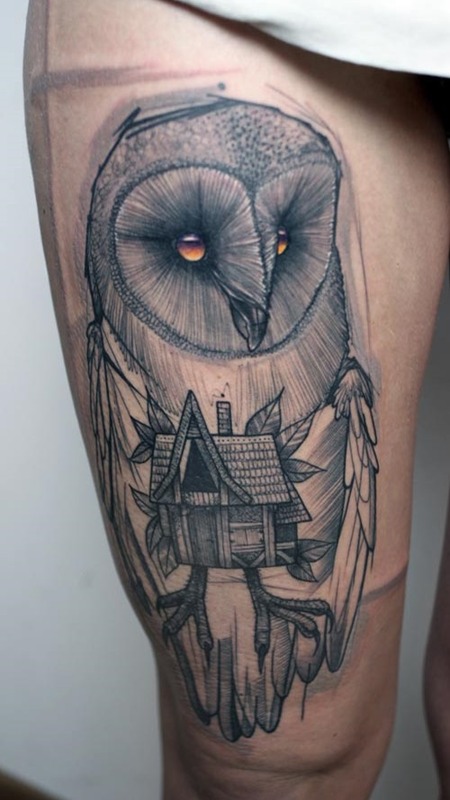 An owl tattoo showing one owl looking after the other. Owls are likely to be anti-social and can represent shy people. 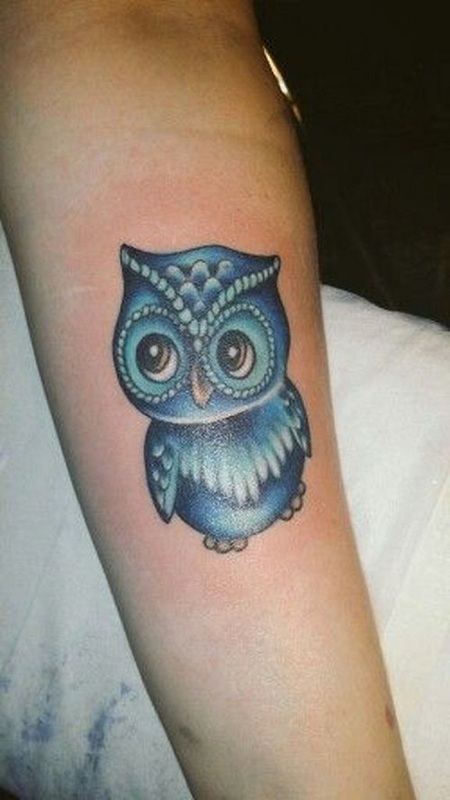 Use a shy owl tattoo to reveal a bit about your shy personality. A timid blue owl yet smart as blue owls represent supreme intelligence. 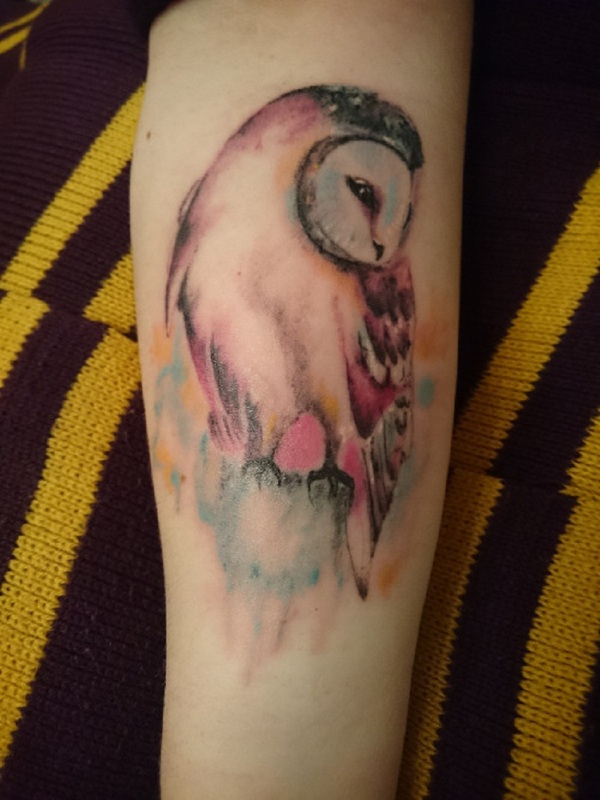 A multi-colored shy snowy owl tattoo looking away drawn using a watercolor technique. 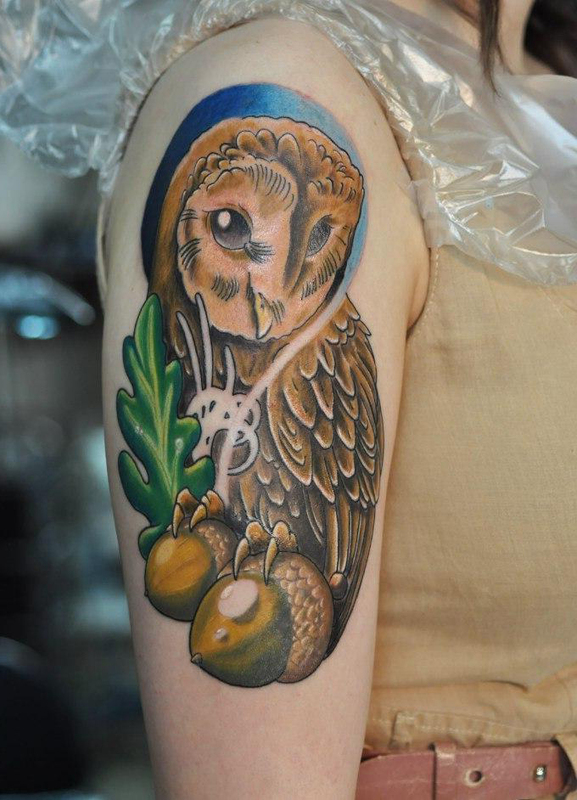 A golden brown shy owl tattoo with blue and green details. 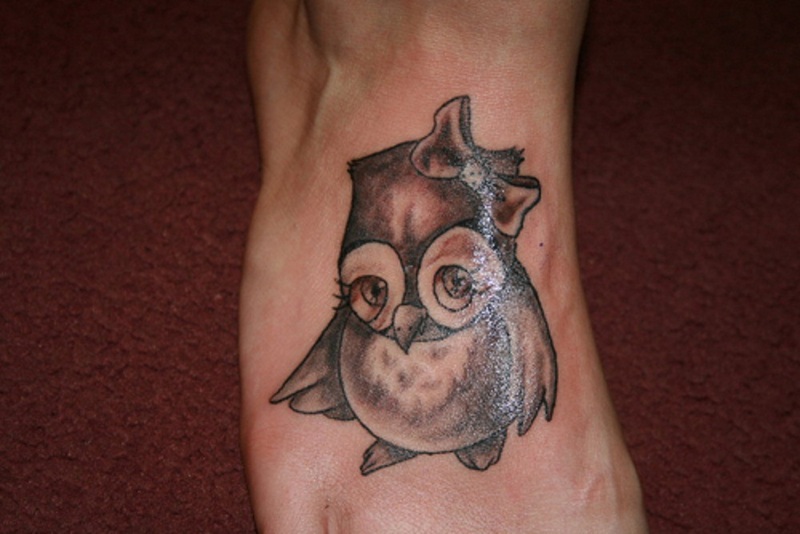 A girly and shy owl tattoo with head tilted down. 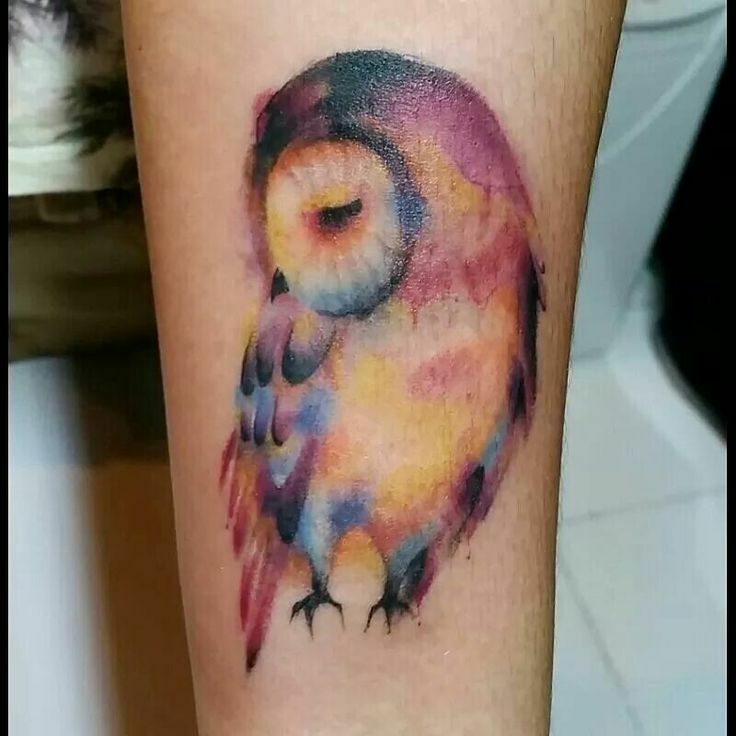 Another multi-colored looking away owl tattoo inked using the watercolor technique. A timid-looking snowy owl tattoo with pretty eyes on the right leg. Are you the protective type of friend? 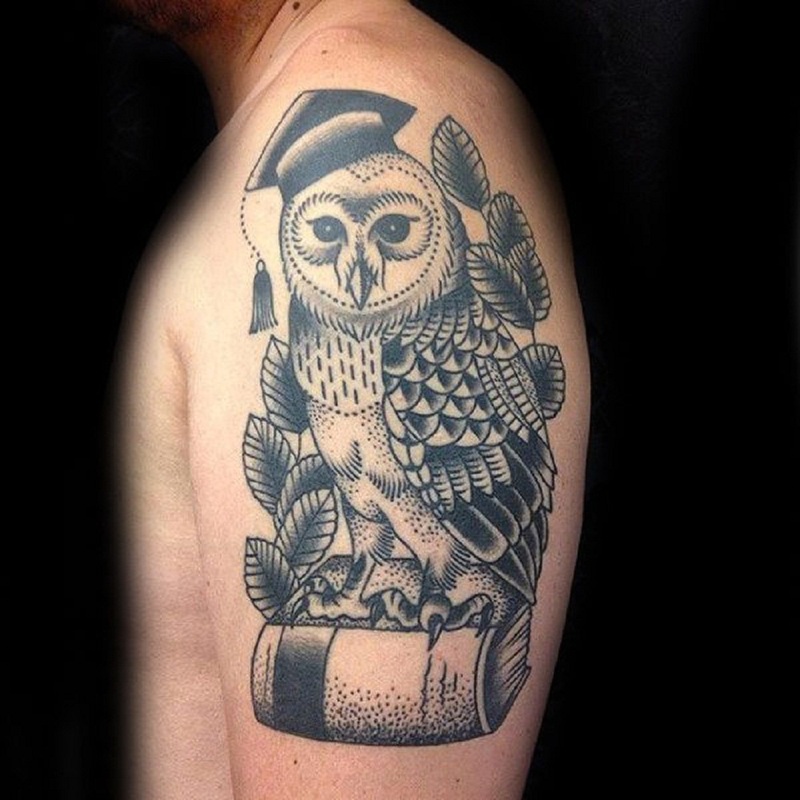 A tattoo with a design showing an owl shielding another owl might suit you. 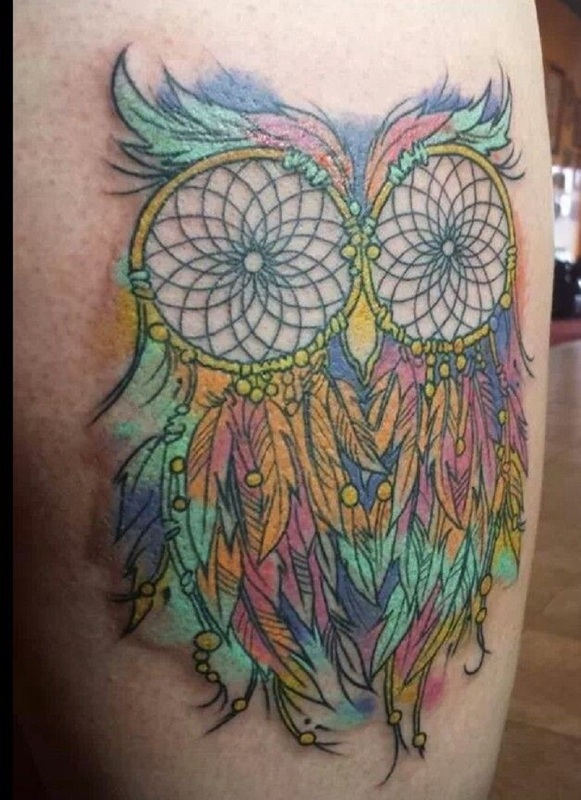 A colorful mother owl tattoo hugging an owlet to protect it. A snowy owl tattoo protecting a wolf, a compass, and other items. An owl tattoo showing an owl protecting a rose that may represent your loved ones. 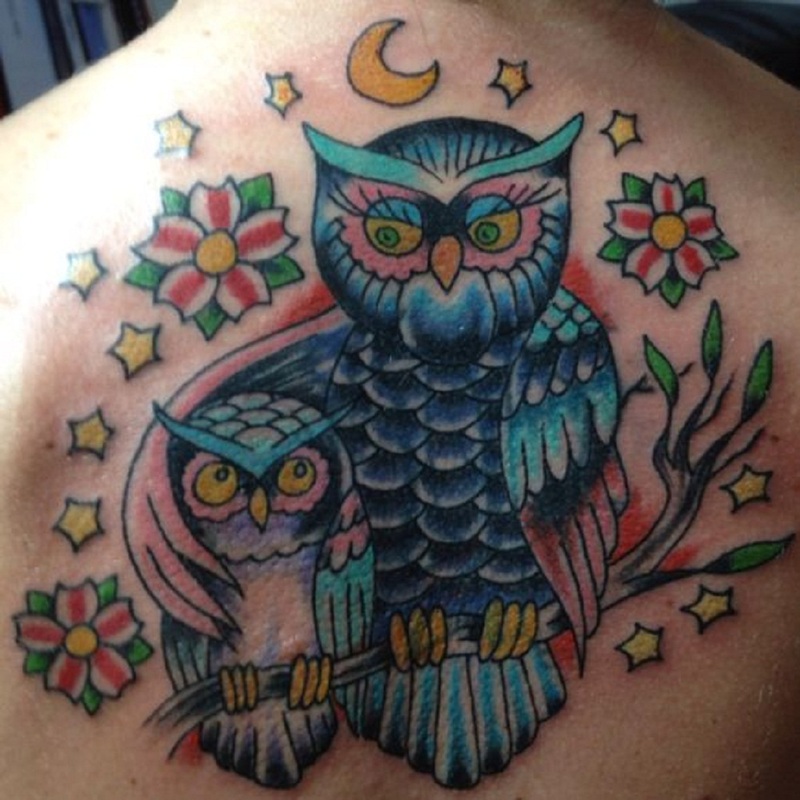 Another colorful and detailed hugging mother and son owl tattoo. 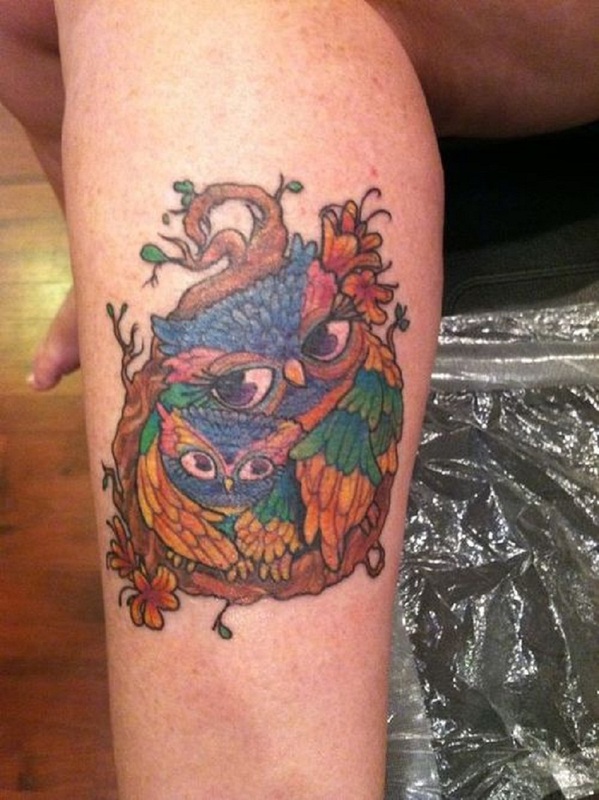 A multi-colored and richly detailed mother and child owl tattoo. There are still many personalities that will match countless owl tattoo variation designs. If you have suggestions or if you want to see more ideas, comment down below. We still have lots of good designs and high-quality samples to show you. Which owl tattoo design did you like the most?